Murder can be spookyOliver Atkinson, married father of two and would be writer, has a woman on his mind. Literally. Violet Tumbleton died in 1948, but now she's taken up residence in Oliver's head. A con artist has taken her name and Violet wants it back.Reluctantly Oliver agrees to help, and is soon entangled in a plot involving a stolen painting, and murder. He's way out of his depth as he juggles household duties, father duties, writing, and a suspicious wife who wants to know about the beautiful con artist he's suddenly spending time with. One thing's for sure, he's going to need all his wits to avoid ending up a spirit like Violet. 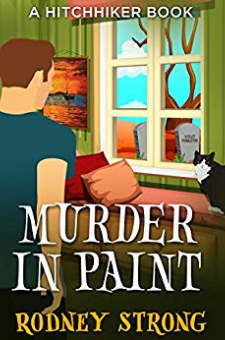 Murder in Paint is a thrilling and humorous cozy mystery full of twists and turns. Author Rodney Strong has crafted an entertaining tale about ordinary people given the chance to do extraordinary things. Pick up your copy today.